Color War is the ultimate experience at camp. It takes the most exciting and the most fun aspects of the summer and combines them into a four-day event. Color War is also an incredible challenge. Color War will test your endurance; it will test your character; it will test your discipline; it will test your focus, and it will test your will. Color War will push you to limits you did not know were possible, and pull you closer to the teammates around you. It is truly the most challenging—and the most rewarding— experience you can have at Manitou. Be responsible to your teammates, and be respectful of yourself and your opponent. Color War is all about the team. No hunter, no warrior, no brave, no medman, no counselor and no chief can win it alone. Use your teammates to strive further and pick each other up when fallen. Expect excellence from yourself, your teammates, and your opponents. Color War pits brother against brother, bunkmate against bunkmate, friend against friend, and Maroon against Gray. Beginning today, Manitou Nation will be divided in two, and at the end of four days, will reunite as a stronger one. 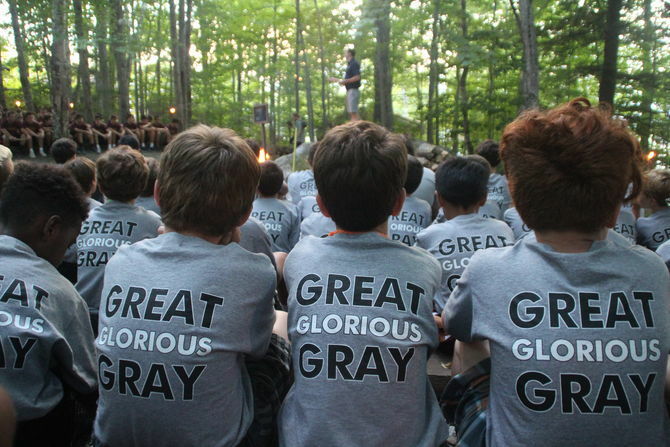 Two men have been chosen to lead Gray and Maroon into battle. These two individuals are true Manitou Men who have distinguished themselves as exemplary leaders of the camp. They are truly deserving of this honor. We are confident that they will lead their teams with great class, dignity and passion.